The Surrey Eagles will head back to the South Okanagan Events Centre for Game 4 of the Fred Page Cup Final on Tuesday night. The Birds lost their first game since March 16th on Monday as the Vees won 3-2. Surrey is still ahead 2-1 in the series. The Eagles were out shot by the Vees for the third straight game as their 11 game playoff winning streak came to an end in Game 3. While Surrey had the edge in the special teams battle during the games in Surrey, the Birds gave up both a power play goal and a shorthanded goal on Monday night. Despite the loss, Nic Pierog found the back of the net again. He's scored in every game in the series and now has eight goals in 14 playoff games after scoring nine time in 54 games in the regular season. 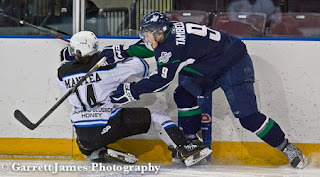 Penticton's offense got back on track in Game 3 after going over 100 minutes without a goal. The Vees remain undefeated on home ice in the playoffs with a 6-0 record and will look to hold serve at home in Game 4. Brad McClure was a big part of Penticton's win on Monday as the Stratford, Ontario native scored two goals -- one on the power play and one shorthanded. The 19-year-old, who is set to attend Ferris State University next season, leads the Vees with seven goals in 12 post-season games.